Pretty exhausted this evening. Left New York 5 am Monday 7/1, spent the night in Davenport, Iowa. Left there 7 am today and arrived in Badlands National Park, South Dakota at 4pm. Had some great birds in a wonderful place. Many animals as well. I only had 33 species, but there were some nice birds among them. 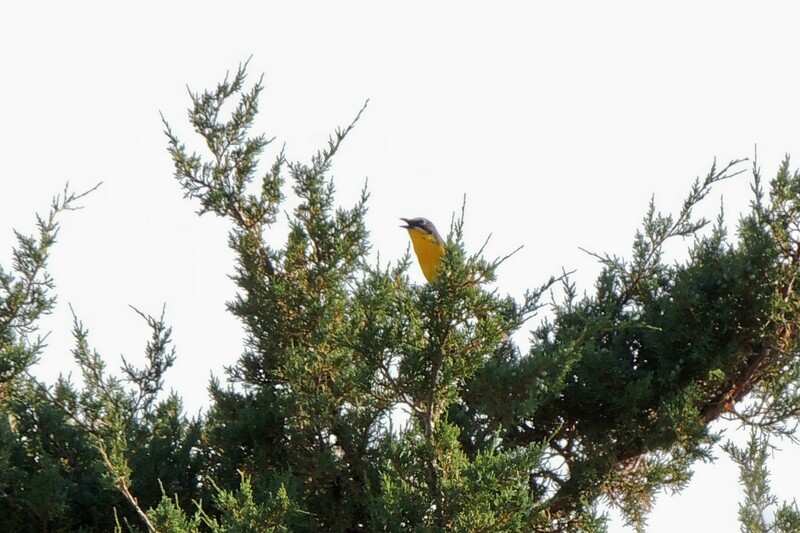 Here are the highlights: American White Pelican, Yellow-headed Blackbird, Brewer’s Blackbird, Say’s Phoebe, Rock Wren, Spotted Towhee, Sprague’s Pipit, Burrowing Owl, Yellow-breasted Chat, Western Kingbird, Lark Sparrow, Upland Sandpiper, Horned Lark and Western Meadowlark. Non-avian highlights included: Bighorn Sheep, Mule Deer, Prairie Dogs and Pronghorn Antelope. We awoke in our hotel in Rapid City and headed directly to Mount Rushmore. I hadn’t been there in 11 years and it was nice to see it again. It is something everyone should see at least once in their lifetime. It was the first time for Theresa and she enjoyed it immensely. I birded the grounds as we learned the history Gutzon Borglum and how he came to create the faces in the mountain. I had my first of year Violet-green Swallows and White-throated Swifts here. A Canyon Wren singing right at the face of the monument was pretty neat. 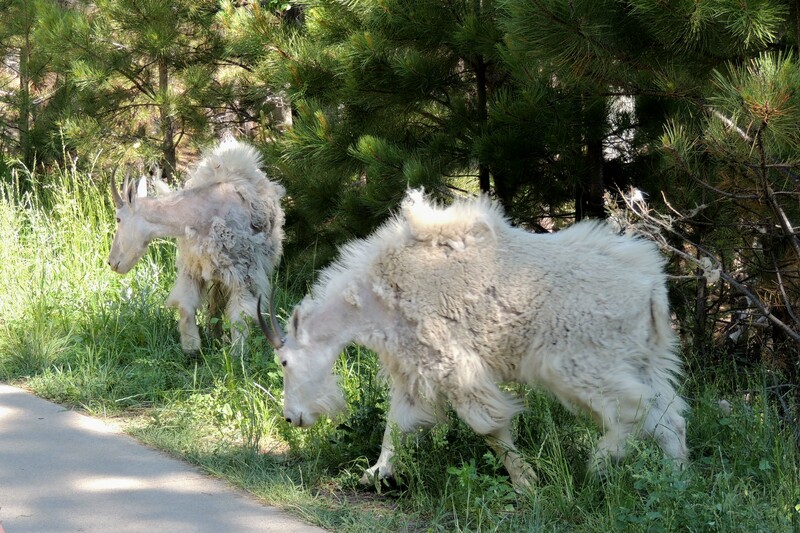 As we walked along the trails, two very frisky Mountain Goats came out and were sparring a bit. One was jumping in the air and challenging the other. As it turned out, they were more interested in scratching in the bushes, trying to get their thick shaggy coats, to come off as it was shedding in a mat off their sides. It was quite a site to see. From Mount Rushmore, we moved on the Custer State Park. This is beautiful place set in the Black Hills of South Dakota. We saw much wildlife along the roads. 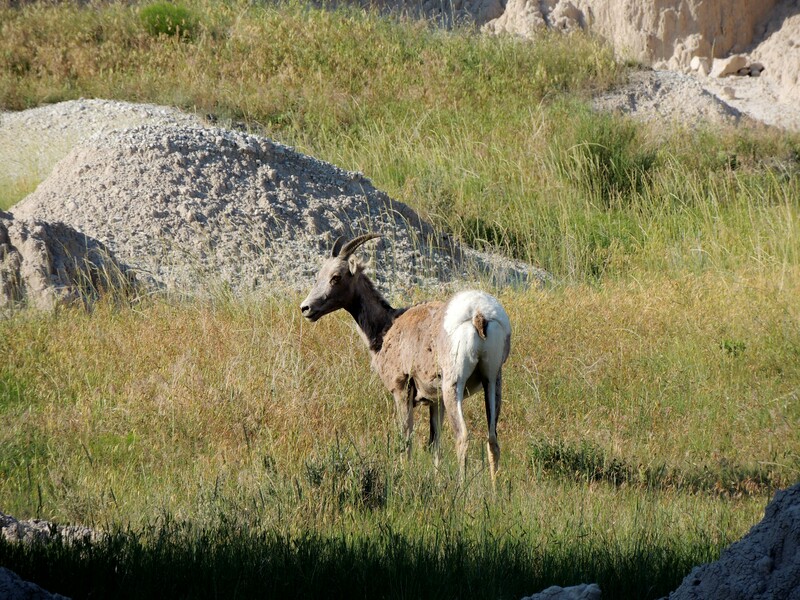 Pronghorn Antelope, American Bison, White-tailed Deer, White-tailed Prairie Dogs and many birds. Here I had my first of year Black-billed Magpie, Cordilleran Flycatcher, Mountain Bluebirds, Vesper Sparrows, and Black-headed Grosbeak. A Red-headed Woodpecker was a nice find. 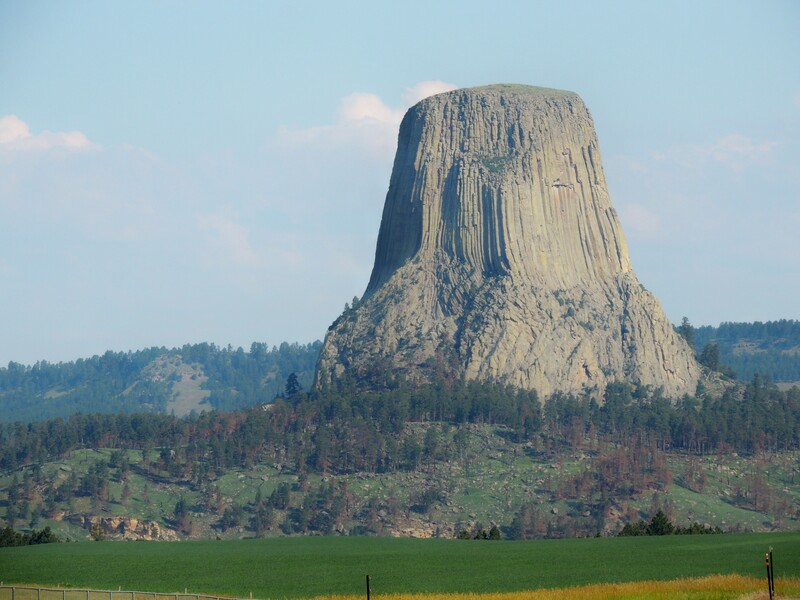 We departed Rapid City early, heading for Devil’s Tower, Wyoming. We made it there by mid morning and enjoyed the view, birds and wildlife. From there we headed on to Cody Wyoming. En-route, our GPS sent us a different direction then planned. We took Rt 16 to Rt 20 to Cody. It was a fantastic scenic drive with lots of Mule Deer and Pronghorn Antelope and many birds along the way. I would recommend this route to anyone driving. Upon arrival in Cody, we checked in to the Skyline Motel, very nice accommodations. Fireworks begin at 10 pm for the big Independence Day celebration. Birding highlights included: American White Pelican, BULLOCK’S ORIOLE, Lark Sparrow, Mountain Bluebird, Red-shafted Northern Flicker, LARK BUNTINGS. After settling in to our hotel for a while, I went one mile down the road to bird Alkali Lake. A designated Wildlife Wetland since 1998. I have birded here before with good results and wasn’t to be disappointed once again. Birds included 40 Wilson’s Phalarope, 3 American White Pelicans, 10 CALIFORNIA GULLS, 2 Cinnamon Teal, 2 Eared Grebe and many more common birds. This brings the total species for the trip to 63 thus far. I started out this morning heading to Alkali Lake in Cody to see if there was any change in birds overnight. I was glad I did. There were more of some things and less of others. As I decided that I had seen everything there was to see, I spotted a gull flying in from the east. It landed, and though distant, it was clearly a FRANKLIN’S GULL. We then headed in to Yellowstone for some birding and sight seeing. We had a great day. Wildlife viewing was just great. We spent 12 hours in the park, leaving only when it got dark. We had many birding highlights. CLARK’S NUTCRACKER, WESTERN AND CLARK’S GREBE, MOUNTAIN CHICKADEE, BREWER’S SPARROW, GREEN-TAILED TOWHEE and BARROW’S GOLDENEYE. In a way, the wildlife were the show stoppers today though. Bison, Antelope, Elk, Coyote, Mule Deer and Black Bear were all seen. I believe there had to be 2000 Bison in Lamar Valley. The best sighting was when we came upon a car stopped in the road. A man was getting into the car and I asked if he had seen something good. He replied that a Black Wolf had just crossed and went up and over the hill. I thanked him and we went to the nearest turn around spot and headed back to that location. 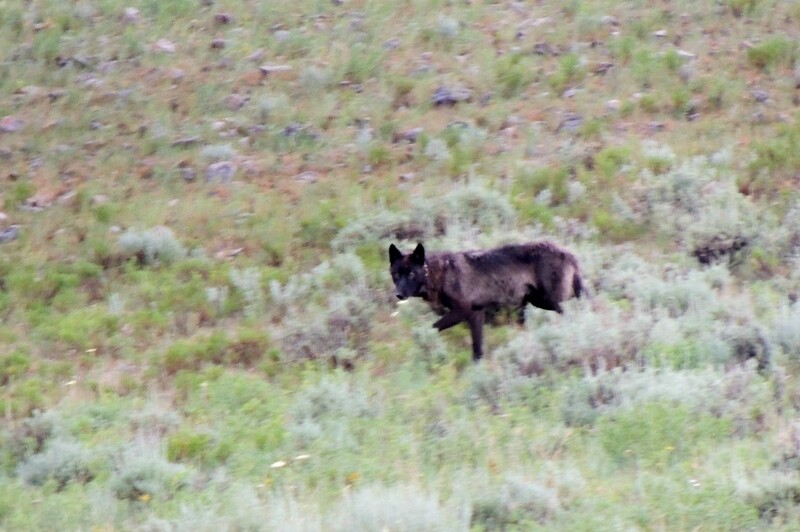 As we neared, I spotted the wolf running along the ridge. It dropped down in our direction and I was able to get several shots of it. It appears to be a young wolf, and is radio collared. It remained in view long enough for several other cars to come along and see it, then disappeared. What a great day. This morning we traveled from Livingston, Montana to Seattle, Washington. This was a day dedicated to travel, so wasn’t very birdy. That said, I saw many species along our route. 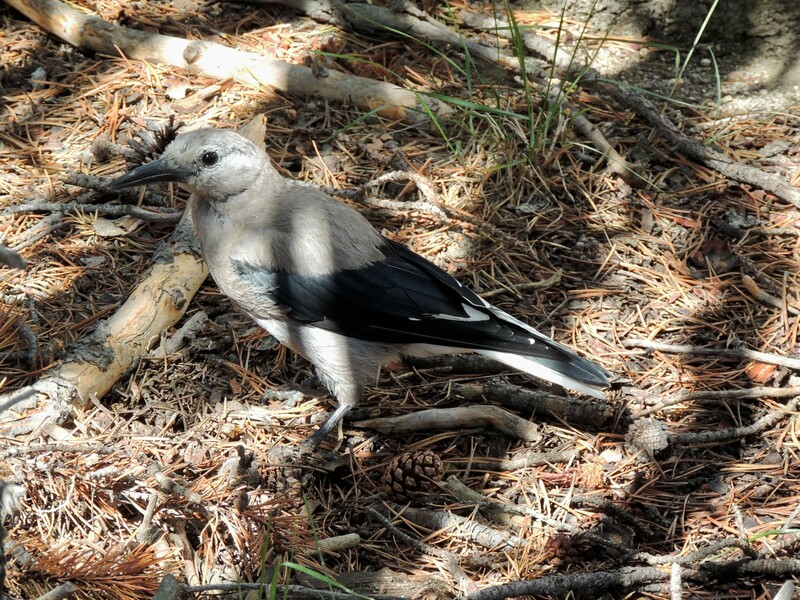 Black-billed Magpies, Swainson’s Hawks, Brewer’s Blackbirds, American White Pelican and Eared Grebe were all seen. Upon our arrival at our hotel, I found three CHESTNUT-BACKED CHICKADEES in the spruce trees behind the hotel. I also had four NORTHWESTERN CROWS in the courtyard. That will be it for the first portion of the trip. For anyone interested in following the “ALASKAN CRUISE 13” portion of the trip, just click on that title in the index bar above. I may only be able to post while I am in port, so postings may not be as frequent. Hope you will follow along and enjoy. WOW! Makes me want to pack a bag and head out to parts unknown with binoculars and camera. Look forward to the next chapter. thanks for sharing! Thanks Shelby, the next post is forth coming. Glad you enjoyed it.